You'll be £12.00 closer to your next £10.00 credit when you purchase Eyewitnesses at the Somme. What's this? In 1915, news of the Australian and New Zealand Army Corps landing and the slaughter at Gallipoli stirred tens of thousands of young men to go to war. They answered the call and formed battalions of the Australian Imperial Force. By the time the new recruits were combat ready, the campaign at Gallipoli had ended. Their battlefields became the muddy paddocks of France and Belgium. Based on eyewitness account, Eyewitnesses at the Somme traces the story of one of these battalions, the 55th, from its birth in the dusty camps of Egypt through three years of brutal, bloody conflict on the bitter western front. When the Great War ended in 1918, over 500 of the 3,000 men who served in the 55th had been slain and another 1,000 wounded. Eyewitnesses at the Somme, shares personal stories of Australian men as they stared down the horrors of war with determination, courage and mateship. 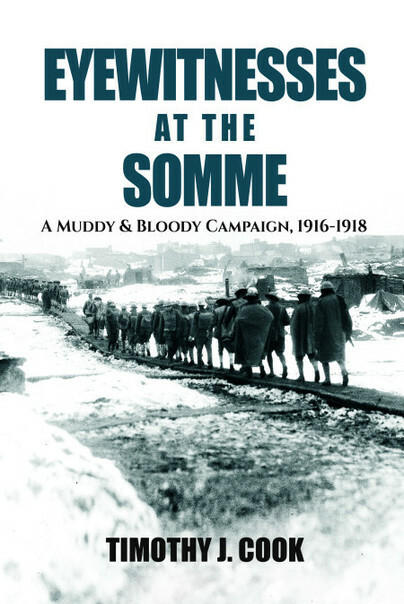 With chapters devoted to the significant battles at Fromelles, Doignies, Polygon Wood, Péronne and Bellicourt, this book tells the story of one battalion, but in doing so it encapsulates the experiences of many Australians on the Western Front. Tim Cook's book is a magnificent tribute to the Australian 55/Battalion: it brings home the many privations and horrors of their war. Recommended. Tim Cook’s book is a magnificent tribute to the Australians of the 55th Battalion: it brings home the many privations and horrors of their war. Recommended. This marvellous book is not unique- there have been others recounting the Australian contribution to the first world war, but eyewitness accounts make this one so much more poignant than others I have read on this subject. The statistics are staggering - one-sixth of the men of the 55th battalion were killed and a further 1000 injured. Their story is one that will resonate with people who still want to read about the many thousands of unsung heroes of the Great War, and Timothy Cook has done us a great service by putting these accounts into a readable format.